Blood From Human Umbilical Cords Helps Aging Mice Remember : Shots - Health News Researchers found that a protein in human umbilical cord plasma improved learning and memory in older mice, but there's no indication it would work in people. Researchers found that a protein in human umbilical cord blood plasma improved learning and memory in older mice, but there's no indication it would work in people. From the beginning, the findings were exciting, complex and, sometimes, contradictory. For example, scientists have shown that young blood can restore cell activity in the muscles and livers of aging mice. They've also found that linking old mice to young ones helped reverse heart muscle thickening. On the other hand, researchers weren't able to replicate some of the most eye-catching findings and another study concluded that, in mice that swapped blood without being connected surgically, the negative effects of being exposed to old blood outweighed the benefits of getting young blood. What was clear was that, like humans, as mice age their bodies and their behavior change on a fundamental level. For example, older mice stop building nests, and they tend to become forgetful, taking a long time to remember how to escape from a maze. "We see a pretty dramatic difference between young and aged mice in terms of their performance," says Joe Castellano, a neuroscientist at Stanford University School of Medicine. Castellano and his colleagues wondered if young human blood might have beneficial effects for aging mice. Now, they report in the journal Nature that they've found a protein in human umbilical cord blood that improved learning and memory in aging mice. It's an exciting find in the field of regenerative medicine. But, scientists caution, it does not mean people should start ordering umbilical cord blood online. There is no indication that it would work in humans. For their study, Castellano and his colleagues collected plasma, which is the watery part of blood, from people of different ages. Some were in their 60s and 70s, others in their 20s. They also collected plasma from human umbilical cords. Then, they injected human plasma from those different age groups and from umbilical cord blood into mice several times over the course of a couple of weeks. The mice were 12 and 14 months old, which is approximately the mouse equivalent of being in your late 50s or 60s. When they dissected the mouse brains and inspected the hippocampi, they found that certain genes linked to making new memories had been turned on in some of the mice. "So, we had a hint early on that one of these donor groups, specifically the [umbilical] cord plasma, might be having an effect on the brain itself," he says. Next, they injected more aging mice with human plasma and tested the animals' ability to remember things. 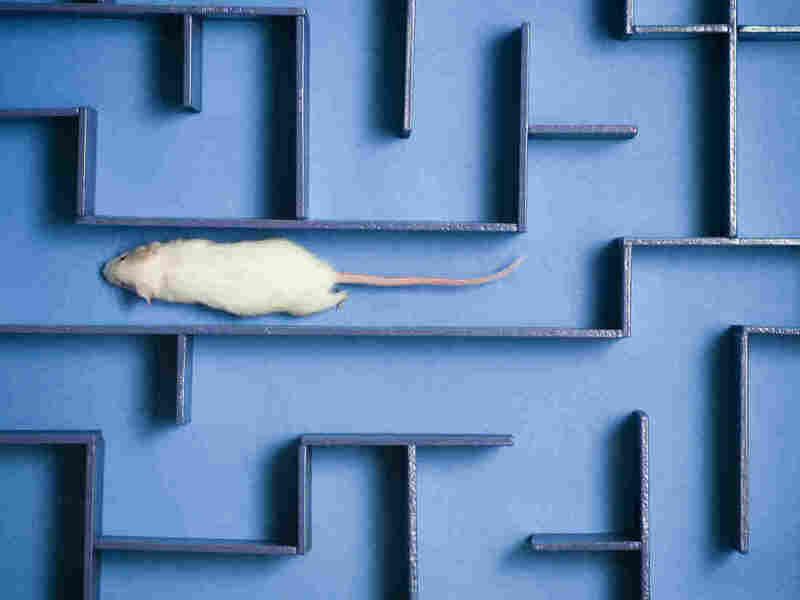 For example, they watched how long it took the mice to escape from a maze the mice had done before, using visual cues to choose an exit that would lead to safety. Castellano says it's basically like observing a person try to navigate through a crowded garage to locate their parked car. Before being injected with umbilical cord blood, Castellano says, "their performance wasn't very impressive." It took them a long time to learn and remember the location of the escape hole, and some of them didn't manage at all. "But after cord plasma treatment, both the time [it took to] find it, the rate at which they'd find it and the fact that they do find it was improved and changing," he says. Similarly, mice treated with human umbilical cord blood performed better on a second memory test. That test involved introducing mice to a chamber and then delivering a little shock to their feet. Mice that remembered the unpleasant experience would, when reintroduced to the chamber, freeze in anticipation of the shock. A forgetful mouse, on the other hand, would go about its usual business. Castellano says the mice that had received umbilical cord plasma froze more often. "We were, first of all, surprised and excited that there was something in human plasma, and more specifically there's something exciting about cord plasma," he says. After a series of other experiments, Castellano and his colleagues concluded that one protein, called TIMP2, in human umbilical cord blood was likely responsible for the improvement. When they removed TIMP2 from cord plasma and injected the plasma into mice, they didn't observe any improvement on the memory tests. And when they injected plasma containing TIMP2 into elderly mice, they again observed improvement in memory and learning tasks. "The really exciting thing about this study, and previous studies that have come before it, is that we've sort of tapped into previously unappreciated potential of our blood — our plasma — and what it can do for reversing the harmful effects of aging on the brain," says Castellano. It's an intriguing hint at how potential therapies might someday work to prevent age-related illness, including Alzheimer's disease, from developing. "The desired outcome is overall whole body rejuvenation," says Aubrey de Grey, a biomedical gerontologist who founded the SENS Research Foundation. The study by Castellano and colleagues, he says, is an "excellent" starting point. "The only thing, of course, is that it's a mouse experiment and mouse experiments often don't actually translate faithfully into the human setting," he says. And Castellano agrees that this finding does not mean that people should start sprinkling TIMP2 protein on their cereal or signing up for umbilical cord transfusions. First off, he says, there's no evidence that elderly humans would experience the same effects as the mice did in this study. It's also unclear what would happen to mice if they received the plasma for more than just a few weeks. There's also the nagging worry that, while proteins like TIMP2 may be beneficial for developing babies, they could be harmful in older humans. "Maybe there's a reason that older brains aren't exposed to certain proteins any longer," says Castellano. And Irina Conboy, who studies aging and degenerative diseases at the University of California, Berkeley, points out that the TIMP2 protein is actually present in higher levels in people with Alzheimer's disease. That runs counter to the argument made by Castellano and colleagues that TIMP2 is associated with improved memory and learning, and that TIMP2 levels would drop as people age. "TIMP2 is a very well-known protein," she says. She also notes that one of Castellano's co-authors, Tony Wyss-Coray, is the board chair for a company called Alkahest, which has separately studied plasma injections as a potential treatment for Alzheimer's. And, Conboy says, there is no indication that the TIMP2 Castellano and colleagues detected in mouse brains actually came from the injections of human plasma. It's unclear, she says, whether a protein in plasma could actually make its way from a mouse's bloodstream into its brain, or that, once there, it could actually impact brain function. Last year, Conboy published a study in which she and colleagues swapped half of the blood in old mice with that of young mice, and vice versa. They saw signs of regeneration in the muscles and liver. But, says Conboy, "There was zero positive effect on the brain. The mice were not smarter. They did not learn better." Such conflicting results reflect two fundamentally different ways of thinking about aging. From the point of view of Castellano and colleagues, aging involves a loss of beneficial materials; for example, diminishing amounts of proteins that were once present in the plasma. To Conboy, however, "The problem is not that you run out of positive things, but that you accumulate negative things." She and others hold that proteins likely accumulate with old age, sometimes inhibiting certain functions, including the growth of new cells. "We have hundreds of proteins that change with age," she says, and finding a way to reduce the effects of aging will likely require tinkering with a huge bouquet of them. "If you are looking for miracles, it will not come from [injecting] bodily fluids," she says. "There will not be one silver bullet."